Business methods have changed. Along with it, has changed the way business owners approach their customers. Gone are days when customers had to find their service or product providers. We live in an age where product or service providers are constantly looking to shorten the gap between them and their customers. Tables have turned and the first attempt to reach out is made by the business owners. Any mobile application development company would cash in on this rage to create mobile apps for even the smallest of things. Companies spend millions of dollars to reach out to their potential customers. Not everyone on this planet is at the same level. Many may not have the access to television, radio or hoarding boards or signage billboards on the sides of Broadways or high streets. But with the ever-evolving world of mobile communication, there is one common platform where we can get all of them together, that is the platform of the mobile internet. Facts suggest that out of some 7.125 billion human beings in existence on this planet, approximately 4.77 billion of them have mobile phones in their pockets. These 4.77 billion mobile users are spread across a handful of 3 or 4 mobile operating systems. Launching your app on platforms of various application vendors can help you reach up to 4.77 million people, which is an impossible task to do otherwise. Be it a bank or an online retail shopping website, demanding services or products is away by merely a few taps on our fingertips. Instead of the traditional way of shops and showrooms, now an entire catalog of your product or services can be seen on every mobile screen. 10 years back there was no way one could do business with their potential customers while they are sitting on their lounge sofa, on way to their workplace in a train, or even relaxing beachside on their holidays. It is possible now through a mobile application. People these days are very addictive to feeds. They want to know what going on around them, and the term “around them” has become very niche. Most of the people know what their phones tell them. With your own mobile application, you can inform them about your business at your convenience and in the way you want. Think of a grocery store 50 years back. Think of how they could tell the entire city what new they have got in their store. A signboard outside? Or the traditional way of yelling interesting jingles across the street? Think how far this message would reach. Not too far. With push notifications, an app can send data to their customers at any point of time. Having new stock, an introduction of new services, discounts or offers on current product or services, things like these can be better informed to customers with the help of push notifications. Some apps even go further and offer happy hours where they instantly announce limited period discounts or offers to get highest users using their apps. Your app, your way. Marketing your brand becomes easy with mobile apps. You can impose your brand logo, your colors, animations, taglines at any page at any time. Consider putting animations or logos or taglines at each shift of pages. Let your customers remember you for a long time even after they have closed the application. Build your brand, however big or small it is. Personalize your app in a way that a customer goes through the roots of your services and gets a unique and distinguished experience of business. Design your app in a way that it is accessible even with weak signals. Your app can provide static offline information even when the customers do not have an access to the internet. This makes the app better usable & improves your bond with your customers. Everyone likes anything that comes for free. Any application development company can help you get apps that work off-line. So in case of a weak signal, your customer may jump to your app if you provide them off-line access. Many giants of online retailing have now introduced a feature where an off-line user can even place an order. The app stores the data & forwards it automatically to the parental server when the app is connected to the internet. You can create a channel directly to your customers. An application development company can have these 4 pillars on which an app can stand firm: general info, ease of contact, search and user account. You can divide your business app in these 4 basic aspects. With general info, you can provide an overview of your brand, your company or your services. With the help of the search, you can simplify the needs of your customers. Customers should be able to find their search by simple taps so that they do not have to bear the irrelevant information and data. With the help of a user account, users can create their own field where they can shortlist their favorite products or services, they can store their preferences and they can also keep a check on their activities in the app like tracking record of the purchases they have made, what they searched recently and what they would like to see in the app in coming future. According to a survey, about 91% of the mobile internet is used for social networking. The easiest way to get your potential customers is by diving into the ocean of social networking. By providing direct logins from social networking sites, any business owner can almost drag a customer to its platform in its literal meaning. A survey says, 68% of total users of Facebook access the network from their smartphones. This statistic goes even high for twitter (86%) and Instagram (98%) and Pinterest (95%). Just when we thought computers have taken over the methods of business, they’re also history now. Phones are in. Websites are gone, apps are in. By a simple single sign in tap, a customer can remain signed in and can retrieve their usernames, and personal details from the respective social networking website. One of the prime reasons why any business owner should invest in making a mobile app is the fact that mobile apps can actually earn you more than your product/service selling. Using ads and sponsorship methods, your app can earn money from a third party. Some apps offer in-app purchases, which is always boosting to your business. What an application development companyforget these days is that the monetization of apps should not be done over the cost of an app user’s convenience. Some apps navigate to a third party application or a random web page that you may not want to access. Some apps make you do unnecessary clicks. Sponsorship and ads should be accommodated in an app in a way that it affects the user to its least. Another key benefit of having an app is that you get a very quick feedback. Be it about your company, product, services, or the way your company does business, you get an instant feedback from your customers. A mobile application development company can also offer a live messaging service that enables your customers to ask questions directly to one of your business representatives. This helps you know your customers better. Compared to earlier feedback forms and notes, now you can have customer feedback every time your customer interacts with your business app. Not everyone who accesses your app can be your real customer. You can reach to your target audience faster with the help of some location and GPS services in your customer’s smartphone. By simply remembering and storing a customer’s GPS location, you can provide them nearby services that you can offer them. If it is about travel or transportation, you can offer them nearby attractions. By storing their previous searches and keywords they enter, you can get to know what your app users are exactly looking for. Based on all this data, you can better offer them what they are looking for. The feedback system can also be integrated and by that, you can get to know what else the customer looks forward to in your website. Finally, the most obvious reason why you must have a mobile app is that you do not remain time bound. You do not need to be awake or attendant if your customers are looking into your catalog. A programmed app is doing things for you. Comparing business through traditional stores, this changes the whole game. Stores cannot remain open all day, apps can. So even at midnight, or on vacation somewhere out, or in a different time zone, a mobile application development company can offer apps that make business provide services to your potential customers, which is not possible at all with the traditional and non-digitized ways of doing business. So these are some prime reasons why you must have a mobile app that offers your business services, no matter how big or small your set up is. Ways of doing business are changing. The ever-evolving world of mobile communication is a blessing to business owners. Hurry up! Don’t miss out on an opportunity to reach to a quarter of the earth’s population for your business! Its a great article. Truely the world has moved into mobile while the desktop is almost history now. Mobile apps are quintessence of any flourishing B2C industry now. The 10 points in this article would also look great in an infographic form. Quite fine post, I definitely love this site, keep on it. Now a days every one using mobile, it is the major key role in our life. Above he mentioned a good information regarding mobile apps helping to business. Nice post, Thanks for sharing informative article. 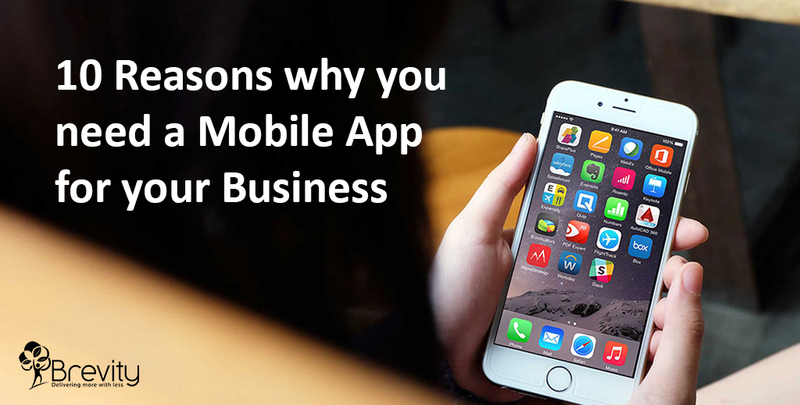 Thanks for sharing your valuable thoughts on why you need a mobile app for your business. Thanks for good information and way of explaining, This will be really useful about Multiple Reason Why Every Business Need a Mobile Apps. Thanks for sharing. Its a very nice article.The 10 points in this article would also look great in very useful form .now days mobile application will be use by each and every business. Great information has been shared with us here. You have presented a very nice article based on the necessity of Mobile applications to connect our customers directly improving the chances of achieving our business objectives easily. Our customers are few taps away from our business when we implement mobile app for them. No doubt mobile application development companies are booming rapidly due to increasing demand of upgraded smartphones.